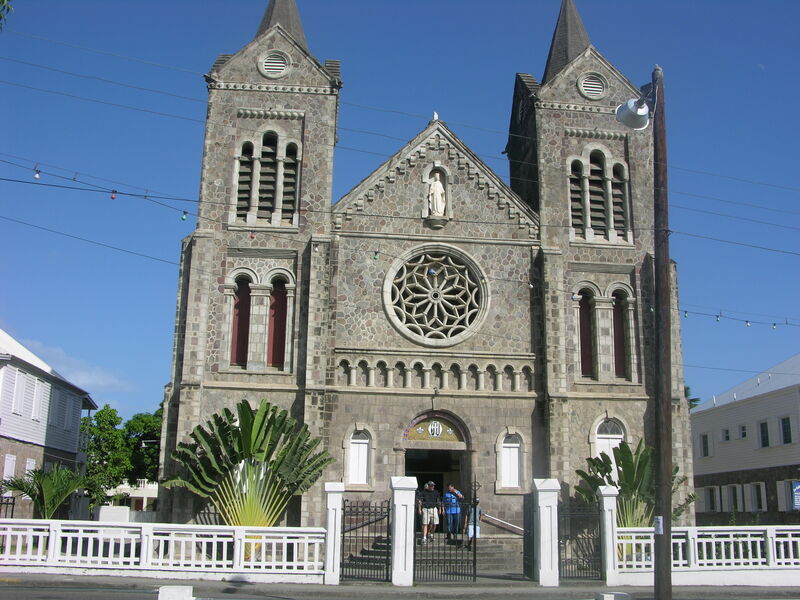 “..in the early stages of the French occupation of Basseterre, a Roman Catholic Church was erected in the town by the Jesuits and dedicated to Our Lady. Notre Dame was burnt to the ground in 1706 during the Anglo-French War by English soldiers who were billeted there. The Church was re-built by 1710 and re-named St. George’s. From the 1720’s, it became a place of worship for the Anglicans. After the take-over of the island by the English in 1713, Roman Catholics were forbidden by law to worship in public. They also suffered certain civil and military disabilities. For example, Roman Catholics were required to take and subscribe certain oaths and declarations, such as the declaration against Transubstantiation, before they would quality for civil or military office or for sitting and voting in the island’s legislature. An Act passed in 1829 finally to remove all disabilities. As a consequence, there was a revival of Roman Catholicism. A church was built in or about 1856; it was called the Church of the Immaculate Conception. In 1927, it was demolished and replaced by a modern edifice on the same site on East Square Street. Father Claeys who was an architect of repute designed the church. It was dedicated on 6 December 1928. The Formation House was the residence for the Catholic nuns and the Manse was for the priests. 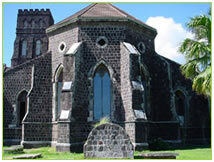 The Moravian Church in St.Kitts began as a mission to slaves in 1777. Like so many of the Moravian missions to islands in the Caribbean. The first missionaries came by invitation of a planter. In this case James Birkby and John Gottwatt arrived in Basseterre harbour on Sunday 14th June, 1777 at the invitation of John Gardiner, an English solicitor and planter. These two missionaries were accompanied by the pioneer Moravian missionary to Antigua, Bro. Peter Brown. They received much encouragement from the daily watchword for the day: “And it shall come to pass afterward that I will pour out my Spirit upon all flesh. “ (Joel 2: 28). Not only did the missionaries have the support of John Gardiner, but they also had the moral support of the Governor. After living in rented premises on College Street, the missionaries were able to move into their own mission house on the present Victoria Road in 1785. This mission house served as both dwelling and house of worship. The first church would only be completed some years later. In 1786 land was purchased and work stated on the Church in May 1789 under the leadership of the missionary Br. Johann Friederich Reichel. Bro. Peter Brown was sent by the Mission Board to give his advice on the intended structure which was to be modeled on the plan of the Spring Gardens Church in Antigua. The new church was dedicated to the glory of God on October 11, 1789. A full day was that October Sunday for the missionaries, as the dedication was followed by the baptism of seventeen converts in the morning and a lovefeast in the afternoon which was followed by the sacrament of Holy Communion. After twelve years of labour the missionaries were caring for about 300 souls which included 60 communicants, 87 baptised, 18 candidates for communion and 122 for baptism addition to this the missionaries were visiting and proclaiming the work on more than estates on the island. The remaining years of the Eighteenth Century were marked by the missionary progress in terms of converts, rising and falling sugar fortunes, depression and natural disasters. By the end of 1797 a chapel had been built on the estate of General Burt near Sandy Point and a decision was taken to establish a mission at Cayon. This, however, did not come to fruition as soon as expected, primarily because of the high cost and scarcity of building materials. The mission continued to find favour with Governor Thomson and his successor, Lord Lavington. At the turn of century additional missionaries arrived in the persons of Bro. and Sis. Hofman, but scarcely had they been there two years when Bro. Hofman was carried into eternity by a fever. During the first fifty years several missionaries succumbed to disease, yet the work flourished. In 1827, the membership stood at 5,000 with four missionary couples the Johannsons, Schicks, Hochs and Kloses laboring in Basseterre and Cayon. A hurricane on 17th August 1827 seriously damaged the buildings at the Basseterre mission. By 1835 the church at Basseterre had become too small and was indeed dilapidated. It was decided to convert it into a school and to build a new church. This plan however was delayed by a yellow fever epidemic and the death of four missionaries in 1836. 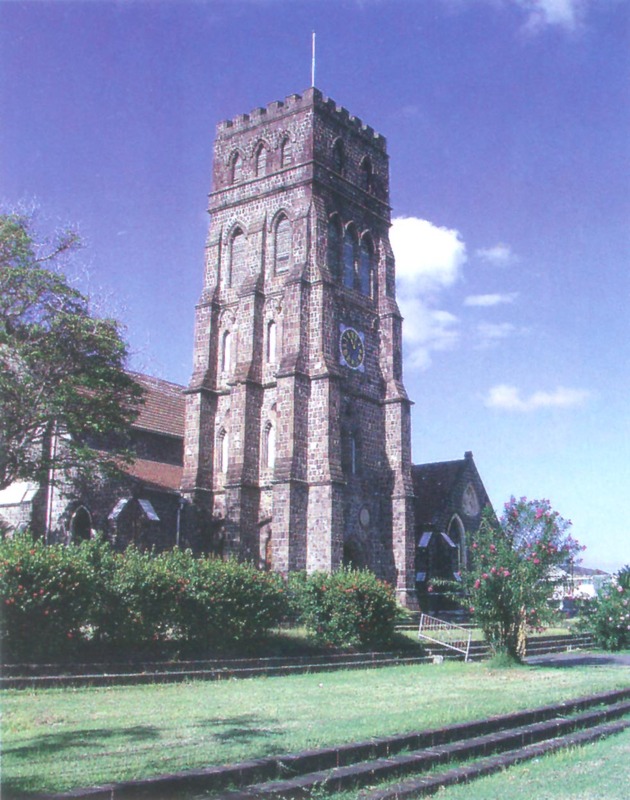 The foundation stone for the new Basseterre church was laid by Governor Cunningham on 16th July, 1840 and the completed church was dedicated on 30th April, 1842. The earthquake of 8th February 1843 caused severe damage to this new church. Further disasters were to follow in fairly quick succession which would affect the congregation at Zion. In August 1848 a devastating hurricane affected the outward circumstances of the people and consequently their support for the church. In 1854 yellow fever and cholera struck. The Basseterre congregation lost 200 of its communicants through these two epidemics. Successive seasons of drought caused poor harvest and in 1863 most of he member were reduced to extreme poverty. In 1867 a fire in Basseterre destroyed a great portion of the town. While the Church buildings were spared, over two hundred members lost everything. In 1871 a hurricane struck twenty-three years to the day, after that of 1848. The Church suffered little damage, but t of worsening relations between planters and labourers. In 1898 another August hurricane struck only to be followed by another one month later. In all the distress the Churches and friends in Germany, Englamany members lost everything. On the night of 12th January 1880, a flood devastated Basseterre, killing thirty members and destroying the property and possessions of others. The closing of the years of the century were marked by hard times and in February 1896 the island saw riots as a resulnd, the U.S.A., Suriname and other parts of the Caribbean. In this distressing situation, there was a mass exodus from St.Kitts particularly of the laboring classes and thus at the turn at the Twentieth Century, there was a decline in the Church. From the very beginning secular education was a part life of all congregations. This came to an end in 1914 when, unable to maintain the schools the Church turned them over to the Government. This was not to be a permanent feature, however, for in recent years the Church has become involved in pre-school education. In the Twentieth Century, restoration work has been done at least twice. For the 150th Anniversary of the founding of the Mission in St. Kitts. In 1927 restoration work was carried out during the tenure of the Rev. Walter Mansfield William on both the church and the school in Basseterre. In May 1948 a bell was installed in the church. The roof of the present church was considered unsafe and worship was shifted to the school room. The church was closed in the 1970s. A steel frame roof was then installed. In 1990, extensive renovations were done including replacing the wooden floor with concrete and the creation of a basement along with general refurbishment. Further work was done in 1993 which included alterations to the balcony and tiling of the floor. Significant work was also done after the passage of Hurricane George in 1998 as the sanctuary sustained some damage. In 2004 work began on the sanctuary. The first phase included the vestry, the bell tower and the altar. The second phase included replacing the old galvanize sheeting on the roof with galvalum, installing a ceiling, rewiring the sanctuary , installing a public address system and repainting the sanctuary. The organ speakers were also remounted. The third phase of the project included strengthening the balcony, re-hanging the windows and hanging new doors. Other minor repairs were also affected. The fourth phase of the project saw the installation of the new upholstered pews and a multimedia system. There is still some work to be done which will be addressed shortly. Until the Cholera Epidemic in 1854, all burials would take place in churchyard cemeteries. It was estimated that one sixth of the population died from the disease. To solve the 'dangerous' health problem posed by the cholera epidemic, the Government purchased land at Springfield for use as a Cemetery for the Parish of St. George. In 1858, legislation was passed prohibiting burials anywhere else in Basseterre than at the Springfield Cemetery. In 1862, the Mortuary Chapel in Springfield Cemetery was erected at public expense for use by all religious denominations to conduct services for those persons who had died at the nearby Cunningham Hospital. was left of the church. Its restoration was completed in 1869, and it has remained intact ever since. Today, the massive square tower of St. George’s. Today, there have been 29 visitors (88 hits) on this page!